A major pleasure in working with spatial data is their visualisation. Maps are amongst the most compelling graphics, because the space they map is the space we think we live in, and maps may show things we cannot see otherwise. 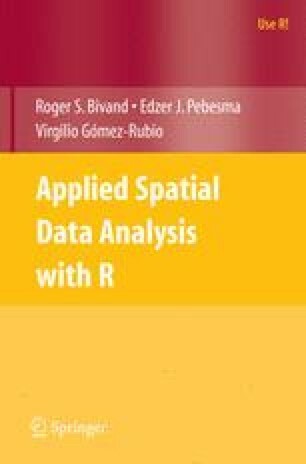 Although one can work with all R plotting functions on the raw data, for example extracted from Spatial classes by methods like coordinates or as.data.frame, this chapter introduces the plotting methods for objects inheriting from class Spatial that are provided by package sp. R has two plotting systems: the ‘traditional’ plotting system and the Trellis Graphics system, provided by package lattice, which is present in default R installations (Sarkar, 2008). The latter builds upon the ‘grid’ graphics model (Murrell, 2006). Traditional graphics are typically built incrementally: graphic elements are added in several consecutive function calls. Trellis graphics allow plotting of high-dimensional data by providing conditioning plots: organised lattices of plots with shared axes (Cleveland, 1993, 1994). This feature is particularly useful when multiple maps need to be compared, for example in case of a spatial time series, comparison across a number of species or variables, or comparison of different modelling scenarios or approaches. Trellis graphs are designed to avoid wasting space by repetition of identical information. The value of this feature, rarely found in other software, is hard to overestimate. Waller and Gotway (2004, pp. 68-86) provide an introduction to statistical mapping, which may be deepened with reference to Slocum et al. (2005).